Although the Traincle only seems to be being sold in Japan at present, Paul Stobbs has recently managed to buy an ex-demonstrator via a contact in Japan, and he brought it to the recent Portmeirion event, where I was able not only to look at it but also have a couple of short test rides. This report gives initial impressions - the next issue of A to B will have a more detailed analysis of the bike. Photograph: The Traincle pictured outside Government House at Portmeirion during the recent event. The Traincle is being sold by Panasonic and a Japanese train company, and is aimed at the commuter market. This titanium model is very light (about 15 pounds excluding mudguards pump etc), but also very expensive at the equivalent of over £1000. It has a short wheelbase and 12 inch wheels, which help to reduce the size of the folded bike, but the folding process is quite fiddly and time consuming. Folding is much less convenient than a Brompton, and although the resultant package is fairly compact, it is certainly not as neat as a Brompton. The short wheelbase means that the handlebars are rather close to the rider, and this, combined with no bar position adjustment and quite a short seat post, means that the riding position is less than ideal even for people of only medium height. 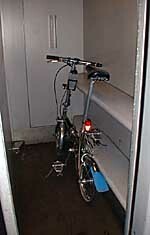 The Traincle is very compact, and disappears easily into the cycle space on a Class 158 Sprinter, as seen here. It is perhaps a reflection of the folding process thought that Paul chose to put it here on the train, while the Bromptons were all folded down and stowed in the conventional luggage space. 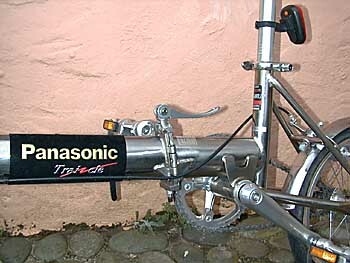 This photograph shows the fixing clamp on the main beam of the frame - the clamp has quite a complex operation of lifting and turning, which may well reduce the risk of accidental operation (I well remember my Bickerton folding up once while I was riding it - not a nice experience) but it does slow the folding and unfolding process. The 12 inch wheels are fitted with National tyres intended for only quite low pressure, and alternatives in this size are likely to be limited. As a further aid to keeping the weight down, plastic tubes are used in the tyres, but an unfortunate consequence is that conventional patches will not stick, so that most people will need to be prepared to switch to normal rubber tubes when they get a puncture, and even then suitable sized tubes may not be easy to come by. Our photograph shows the Traincle with a flat tyre after developing a puncture during the event - a glueless patch proved rather ineffective on the plastic tube, and Paul had to obtain a normal rubber tube from a local cycle shop to replace it. Yes, he did have a spare rubber tube with him, but there were punctures in both the front and rear tubes on the same ride! No mudguards are provided, which again helps to keep the weight down. Paul Stobbs had fitted mudguards off an old Bickerton. Brakes are fairly basic Dia Compe calipers, with rather flimsy and floppy levers. 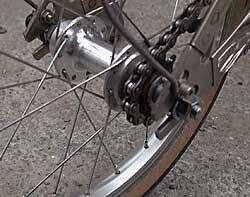 The single gear is about 46.5 inches - a 42 tooth chainwheel driving an 11 tooth sprocket (see photograph for details of the sprocket and hub) with a 12.2 inch rolling diameter. First impressions are of the rather cramped riding position and once underway one is rather reminded of the Microbike, a Bickerton (but MUCH more rigid), or perhaps the Pashley/Brilliant Bicycles Micro. Compared with these machines the position and stability and ride quality feel better than all except the Micro, which I personally would rate as better Saddle height adjustment is just adequate for me, and I am short. The Traincle rolls along surprisingly freely bearing in mind the small wheels and quite low tyre pressure. However, this still feels subjectively significantly worse than a Brompton on standard Raleigh Records. 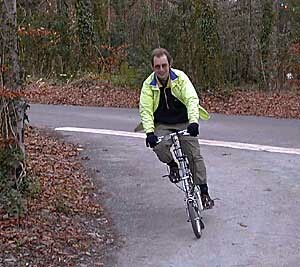 On the very brief tests, the brakes felt about adequate - comparable to those of a standard Brompton. The single gear was about the right ratio for me, though some might wish for something slightly higher, and I would be reluctant to forgo a range of gears, even for train-assisted commuting. I found riding it quite hard work - adequate for getting to and from a station, but I would not want to use it for rides of more than a few miles. Mudguards (not fitted as standard) would be essential unless you do not plan to use it if it is wet, and it would appear that any luggage, papers, shopping etc would have to be carried about your person or in a conventional saddlebag. All folding cycles involve compromises, and the Traincle seems to have given weight the highest priority. In my view this has been taken too far in terms of the negative effect on other aspects of the design. While the bike is exceptionally light, folding is slow and the resultant package is not particularly easy to handle. The single gear and 12 inch tyres limits its suitability for much more than short trips to and from the station etc. However, as with all bikes, it can certainly do longer journeys - with Paul Stobbs riding, the machine kept up a very good speed on the road and coped very well with loose gravel on a cycle track, but I would put that down to the rider. Riders of above medium height are not likely to find the seat adjustment and riding position satisfactory. Light weight is certainly important in a folder when you are carrying it, but if folding is sufficiently easy then carrying the bike can be minimised - roll it on its own wheels as much as possible. 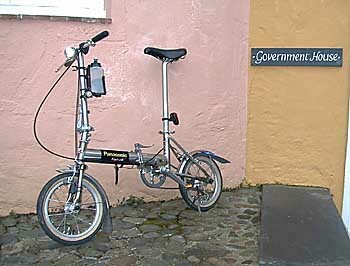 I would rate the Brompton a far better folding cycle in every respect except weight, and the ease of folding of the Brompton means that it does not have to be carried often, and when it is, then the shape of the folded bike compensates to some degree for the weight - and of course a Brompton is cheaper than a titanium Traincle. 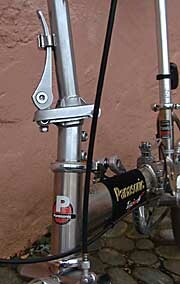 If weight is a major factor, then remember that a Pashley/Brilliant Bicycles Micro in single speed form without mudguards (which is comparable therefore with the Traincle) is 21 pounds in standard form, and could probably be made a bit lighter still by component substitution, at a much lower price. The Traincle is technically interesting, but it does seem to use 'advanced' technology for the sake of it, and the end result is not as practical and does not perform as well in almost all respects as existing leading folders.